On a hot summer day, not many can resist the temptation to dive into a pool or head out to the beach - just over an hour�s drive from Florence. But there are other interesting opportunities, such as going for a swim in the lake or river, without renouncing the comfort of a beach chaise-lounge and umbrella. For example, Lake Bilancino, is a large 5-square-kilometer body of water only a few minutes away from the Barberino del Mugello highway exit (A1 highway � 25 Km from Florence), in the heart of the lush Mugello territory. 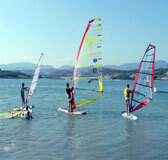 There are two beach establishments on the lake, and various sports and outdoor activities can be enjoyed: canoeing, windsurfing, sailing, fishing, as well as hikes, mountain bike rides, and bird-watching in the WWF nature reserve. Given that the beaches are pebble-beaches, rubber-sole foot-ware is recommended. For comprehensive information, log onto the website of the Lake Bilancino http://www.bilancinolagoditoscana.it/ or of the Comunit� Montana del Mugello. 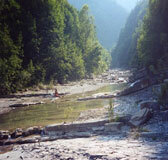 The Renai Park lies about 10 km south-east of Florence, near Signa. You can also get there by bike along the dirt road which begins at Cascine Park in Florence and runs along the Arno River. You can then go for a swim in the public swimming pool or in one of the many ponds within lot 1, equipped with a beach establishment and sailing-boat rental facilities. You can also skateboard, do free-climbing (8-meter wall on two sides), play beach volley, 5-aside, and tennis. Check operating hours on www.parcorenai.it. 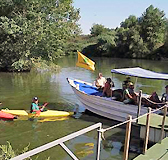 If you prefer the river over the lake and beach establishments are not your thing, why not travel a few extra kilometers to go to the Santerno River, within the territory of Firenzuola � about 60 km from Florence. The source of the Santerno River is near the Futa Pass, and, the stretch of territory that begins at Firenzuola and runs along Via Montanara (towards Imola, and just past the town of San Pellegrino) is dotted with natural pools, falls, and smooth white rocks. The area near Pieve di Camaggiore is especially suggestive, with its lovely stone bridge.